Posture problems affect people from all around the world, no matter the job that they have. Even those that do manage to live a healthy life and always go to the gym will be faced with improper posture in the exercises that they do. It is really important that we learn all that we can about the proper posture that we have to hold while in various situations. 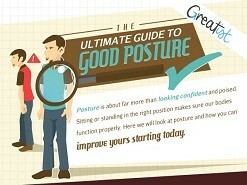 This is where this Ultimate Guide To Good Posture Infographic steps in to give you a huge helping hand. Is posture that important? The answer to this question can only be a resounding YES. As you can see from the very first part of the infographic, there are various reasons why this is the case and various problems that can appear for those that do not follow a proper posture while at work or at home. You will also get to see exactly why bad posture appears. Most people are suprized to notice that many of the activities that they do on a daily basis actually lead towards the development of bad posture. Start fighting bad posture by making the changes that would actually make you feel and look better. After all, nobody really likes to see someone with a hunchback as opposed to a person that is actually standing tall. The individuals that regularly have a bad posture can end up with difficulties breathing, constant aching in various parts of the body and will even have difficulties performing really simple actions like squatting to pick up something that fell to the ground. We are confident that you do not want to be in such a situation. Take all the time you may need in order to be sure that you make those drastic changes in your posture. You will feel more confident and you will make sure that your body functions properly, which is vital.